This issue we are celebrating those involved in the long campaign for improved public transport. The article below is an early Inner Voice article about the activities of Action for Public Transport and its predecessor the Save Public Transport Committee. The aims and objectives for APT in 1978 are still relevant today as is the need to publicise the dominance of the motor / roads lobby that prevents public transport having the resources it needs. Thank you to all those that have and will work for the common good to build the public transport system Sydney needs. In view of increasing community concern over environmental problems, future energy shortages and basic mobility for all sections of our society, it is perhaps not surpris­ing that a group specifically con­cerned with the development of public transport should be formed in Sydney. The idea for such a group was first mooted at a transport seminar held at the Trade Union. Club in March 1972. About 100 organizations were represented at this meeting which was addressed by speakers such as Peter Cox (then opposition shadow minister for transport) and Bob Nielsen who led the Sydney Area Transportation Study. About July an ad hoc group was formed. Six months later this group became known as Save The Public Transport Committee (SPTC) . Save Public Transport set about the task of drawing attention to the problems facing public transit users and publicising the dominance of the motor/roads lobby in this country. During the era of Chief Commissioner Phillip Shirley of the N.S.W. Public Transport Commission, the Save Public Transport Committee got into full swing. With the co­operation of trade unions and other environmentally concerned groups, SPTC succeeded in making public transport the major issue at the N.S.W. election of 1976. Since that time SPTC, amongst other things, has been responsible for the organization of National Public Transport Week in N.S.W., taken part in various conferences and seminars, and prepared sub­missions for the Eastern Suburbs Railway enquiry, the Botany Bay study and Major Airport Needs Study (MANS). Save Public Transport was also instrumental in nurturing the Campaign Against Radial Expressways (CARE) group. 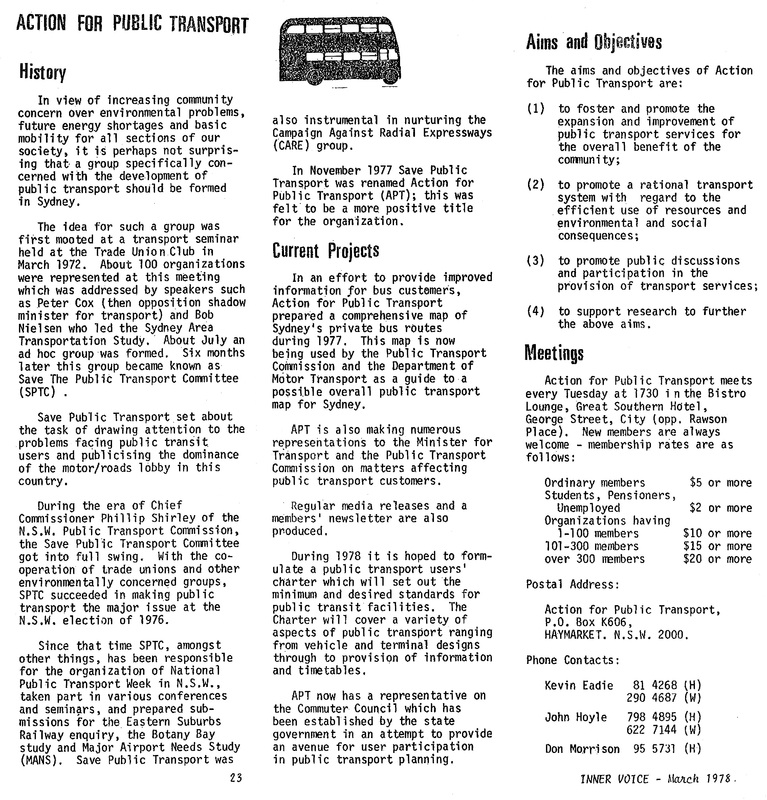 In November 1977 Save Public Transport was renamed Action for Public Transport (APT); this was felt to be a more positive title for the organization. In an effort to provide improved information for bus custemers, Action for Public Transport prepared a comprehensive map of Sydney’s private bus routes during 1977. This map is now being used by the Public Transport Commission and the Department of Motor Transport as a guide to a possible overall public transport map for Sydney. APT is also making numerous representations to the Minister for Transport and the Public Transport Commission on matters affecting public transport customers. Regular media releases and a members’ newsletter are also produced. During 1978 it is hoped to form­ulate a public transport users’ charter which will set out the minimum and desired standards for public transit facilities. The Charter will cover a variety of aspects of public transport ranging from vehicle and terminal designs through to provision of information and timetables. APT now has a representative on the Commuter Council which has been established by the state government in an attempt to provide an avenue for user participation in public transport planning. (4) to support research to further the above aims.